Is Insulin Therapy Good for Seniors with Diabetes? According to the American Diabetes Association, this metabolic disease affects nearly 25 percent of Americans over the age of 65. When not properly managed, diabetes can have some dangerous side effects. However, insulin therapy is frequently used to prevent more serious conditions from developing. 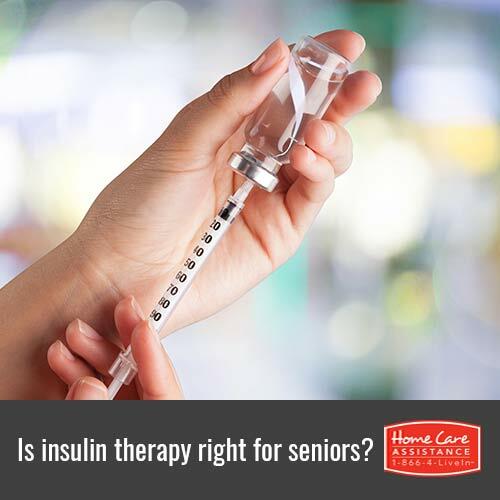 If your elderly loved one is at risk for or has been diagnosed with diabetes, the Harrisburg elderly care experts at Home Care Assistance want to share some facts about insulin and how this type of therapy can be helpful. Insulin is a natural hormone that helps the body use and store glucose. Seniors develop type 2 diabetes when their bodies are no longer producing a sufficient amount of insulin or are not properly responding to the insulin. The treatment involves the use of artificial insulin to regulate blood glucose levels. Each type of insulin can be characterized by how quickly it takes effect and how long it lasts. Seniors can either inject the insulin just under their skin with a needle or use an insulin pump to receive small doses throughout the day. Many seniors choose insulin pumps so they will not need to inject themselves multiple times a day, which means there will likely be fewer swings in their blood glucose levels. An insulin pump can easily be disconnected when taking a shower or going for a swim. The primary benefit of insulin therapy for seniors is the fact it allows them to manage the side effects of their diabetes. This includes issues such as glaucoma, chronic fatigue, kidney disease, and high blood pressure. Treating type 2 diabetes as early as possible can also slow the progression of the disease. When combined with lifestyle changes related to diet and exercise, many seniors can lead a completely normal and healthy life after being diagnosed with diabetes. Unfortunately, diabetes often goes undiagnosed in older adults because many early warning signs such as frequent urination and vision problems are attributed to other medical conditions. This is why your loved one should be screened for diabetes at least once a year whether or not he or she has noticed any symptoms. Though managing diabetes can be challenging, it can be made easier with the help of an hourly or live-in caregiver in Harrisburg. At Home Care Assistance, our caregivers are available 24/7 to remind your loved one to take his or her insulin and other prescribed medications, and they can also help with a wide variety of other tasks, including exercise, nutritious meal prep, and transportation to medical appointments. For more information on our senior care services, call one of our qualified Care Managers at (717) 540-4663 to schedule a complimentary consultation.